If your kicks are worn down and are bare on the bottom due to a lack of tread then it is time to update and get a new pair of basketball shoes. However, in today’s world there seem to be a trillion options and website to pick from when looking to picking your new pair of shoes. Today we are here to help you break down this decision by offering our view on the best places to get a pair of shoes. We have limited our choices exclusively to websites that sell basketball shoes (no brick and mortar stores). Eastbay has been specializing in athletic shoes and gear since 1980. I can remember being a kid and so excited when the Christmas Eastbay catalog would come in the mail when I would drool over the new edition of kicks from Nike, Adidas, Reebok, and others. 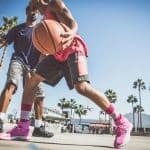 Today however you don’t have to wait to check out the freshest gear, you can simply go to eastbay.com and find your new basketball shoes today! Eastbay is known for having a great selection of the new signature edition shoes from your favorite basketball stars. 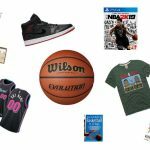 Serious players who want not only a great pair of premium signature basketball shoes but also the newest basketball-related gear available. This choice should seem obvious right? Amazon is the largest retailer in the USA and there is good reason for this. Their customer service and reputation is second to none. They have a huge selection of basketball shoes to choose from. Prices of these basketball shoes are usually really good as well. One word of caution, be careful when buying rare, expensive shoes, as some unscrupulous sellers on Amazon will sell counterfeits. When it comes to buying basketball shoes on Amazon, they make it easy and their customer service is second to none. 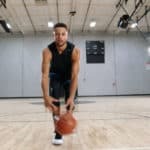 Basketball players who value low prices and a wide variety and selection of basketball shoes in regard to brand, style, and price range. Zappos has been a leading retailer in shoes of all kinds for many years. They are well known for their extremely generous return policy. Zappos has FREE returns, so if the pair of basketball shoes you pick do not fit well or look like you’d hoped, you can return them at no cost. They will even give you a return shipping label! Be sure to check out their extensive selection of basketball shoes. 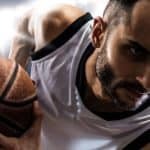 Zappos often has really competitive prices and will generally be best suited for players who want to buy a great pair of name brand basketball shoes, but don’t necessarily want to break their budget in doing so. Players who have specific shoe demands and want to have the opportunity to return basketball shoes that do not fit well. So, are you a sneakerhead that demands unique custom kicks? Well ShoePalace is the site for you. They have a huge selection of basketball shoes in many different color schemes. The prices on these premium basketball shoes are also very competitive. Many of these shoes are models or colorways that I have never seen before and look pretty badass. 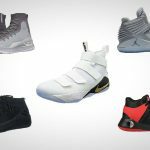 If you are into Jordan brand and want basketball shoes that will turn heads then you may have found your personal shoe heaven. While not as big as an Amazon or Eastbay, ShoePalace.com is definitely worth a peek if you are serious about your shoes and are willing to pay a premium to have the coolest shoes on the block. Total sneakerheads who demand on the flashiest and rarest kicks on the planet. Price is not an issue for you.